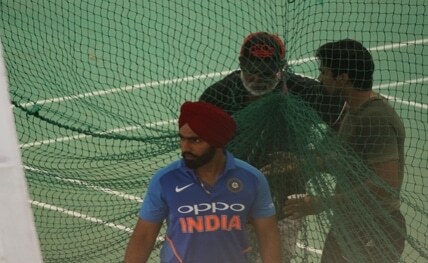 Dharamsala, April 15 : Punjabi singer-actor Ammy Virk has started his training with former India cricketer Balwinder Singh Sandhu for the upcoming film "’83", a Bollywood entertainer on India’s historical 1983 Cricket World Cup win. "Spinning times are coming up! Real training with my Reel avatar Balwinder Singh Sandhu sir from the Dharamshala boot camp. Relive ’83," he captioned the photograph. Presented by Reliance Entertainment, "’83" is being directed by Kabir Khan, and will see Ranveer playing iconic cricketer Kapil Dev. "’83" follows how, under captain Kapil Dev, the Indian cricket team defeated West Indies in the final of the World Cup in 1983. It tracks the coming-of-age of not just a cricketing team but of a young nation in the eyes of the world.